In an emergency, dental treatment is always essential, in order to protect your overall health. You should always try and get immediately treated as soon as the pain appears: you should try not to put dental treatment off. Many times you will find that a 24-hour emergency dentist* is hard to find. Forest & Ray medical group are a 24 emergency dentist in London*. Forest & Ray offer a service that is second to none, with a multilingual team of top class experts and dental professionals. 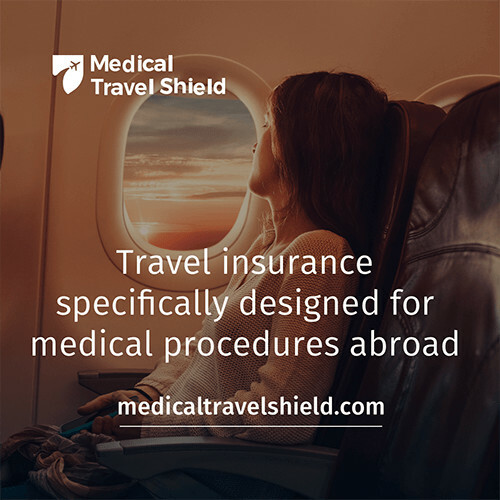 Our team of professionals can help to book your appointment and also consult you as quickly as possible, with the highest level of professional treatment available. We can make sure that you receive the correct treatment as soon as possible, to help limit the amount of damage that could be caused. Many people think that minor dental pains, which include toothache, are not a dental emergency, and they hope that this pain will go away as quickly as it had arrived. However, in some cases it will get worse. In many cases of toothache and other mouth problems, the problem may get worse, and could affect people with sensitive teeth even more. Doing nothing could be a bad idea and could make the problem become more serious and more dangerous. Forest & Ray is the emergency dentist that you can trust. What will happen if I call the emergency dentist number? On dialling the emergency dentist number of the Forest & Ray Dental Practice, you will be answered by a Multilingual Customer Service operative, who will take your preliminary details as your name, phone number and credit card information, and inform the emergency dentist who is on call that day. You will be informed about the earliest dental appointment for your convenience: the one that is the most appropriate and affordable. If a member of staff is not able to answer your call, please leave your name and telephone number on the answering machine, and our colleague will call you back as soon as possible regarding your dental treatment. An abscessed tooth is most often a dental infection that can get as bad as you are willing to let it. The abscess can involve any kind of swelling of the soft gums that surround the tooth, and it can entail the mouth getting clogged up with a quantity of pus. These problems can develop from an amount of tooth decay or even a tooth trauma, which includes any broken tooth. If there is an opening in the enamel of a tooth, such as a cavity, bacteria can get in and infect the pulp (centre) of the tooth and cause an abscess. Once this happens, the infection could spread throughout your whole body. Root canal treatment is usually the only chance to save a tooth once it has become infected. Many adults still do not have their wisdom teeth, as some of them may not erupt out of the gums until a late age, or may not erupt at all. This may lead to tumours or tooth crowding, and may also damage any of the second molars that are in the mouth. Our dentists will check to make sure that the condition of your wisdom teeth is good. This is when we will see what is needed, and decide whether you need emergency dental treatment or not. Our Forest & Ray dental surgery is conveniently placed in Central London, which makes the process of booking emergency dental treatment. A partially erupted wisdom tooth can be very difficult to brush or even floss appropriately, which means that there is a greater risk of developing cavities and also decay. In the cavity, fillings may not remain possible if the problem becomes very bad. Tooth extraction would be the most practical solution to this problem. A partially erupted wisdom tooth can cause bad tooth decay in any other neighbouring tooth. The position of many people’s wisdom teeth can sometimes produce a trap between the wisdom tooth and the neighbouring tooth. This trap may become a home for many bacteria or plaque, which could become lodged in place: this can cause damage, and in some cases the teeth that this has affected will need to be extracted. Most people with diabetes often have some form of gum disease, most often caused by high blood glucose, according to the CDC. People with diabetes need to take extra care to ensure that proper brushing and flossing techniques are used to prevent any progress of the gum disease. Regular check-ups and cleaning sessions with your dental hygienist should be followed. This is the early stage of a gum disease, which can only be solved appropriately and reversed if diagnosed early. The symptoms are red, swollen and puffy gums that bleed frequently. If treatment is not obtained from an emergency dentist, it could develop into periodontitis, which is an advanced stage of gum disease. This disease includes bone loss and is not reversible. Gum disease is one of the main causes of tooth loss in adults, and it is also linked to heart attacks and strokes. Periodontal (gum) diseases, including gingivitis and periodontitis, are severe infections that, left untreated, can lead to permanent tooth loss. The disease itself is a chronic bacterial infection that affects the gums and bone supporting the teeth. It begins when the bacteria in plaque cause the gums to become inflamed. With any tooth that becomes infected, the white blood cell count will increase in all of the infected area. Then the cells inside this area will attack and destroy the infection. Some of the cells will migrate to many of the nearby cells, including some in the hair follicles. With this kind of migration, cell damage will then occur. Alopecia that is linked to the tooth infection is often detected close to the area of the infection. For example, if an upper molar is infected, then sudden hair loss might appear along the temple hairline on the same side as the infected tooth. Hair loss caused by tooth infections can also be seen in the beard, upper lip, eyebrow, or neck areas. Researchers indicate that root caries may be a marker of general physical decline in the elderly, and specifically underscore the mouth as an integral part of the body. Poor oral hygiene is the major cause of periodontal disease, a chronic infection of the tissues surrounding the teeth. 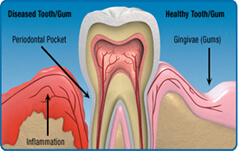 Thus, gum infections seem to add to the inflammatory drag on individuals, increasing cardiovascular risk. Tooth erosion is the wearing away of tooth enamel by acid. 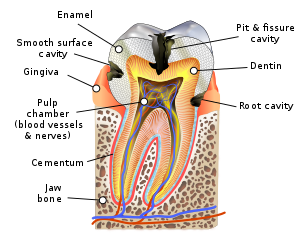 The enamel is the hard calcified tissue that covers and protects the outside surface of the tooth. Symptoms of tooth erosion can range from sensitivity to more serious problems such as cracking. Rounded Teeth - During the early stages of tooth erosion, it is common for teeth to have a rounded look.